For a few years now I've found myself a repeat visitor to the Church of Jesus Christ of Latter-day Saints website. It's not because I'm looking to join the church. No, it's because they've got this fantastic "I'm a Mormon" video series filled with everyday people, funny moments, surprising facts, and excellent editing – all the stuff of captivating storytelling. This video campaign launched at a time when research showed that the church's current ads weren't resonating with viewers; many people didn't know a Mormon or held stereotypical views of them. It's one of the same issues I face when I'm telling stories for nonprofits. Many people in the American public hold stereotypical views of someone who receives food stamps. Others may find it hard to relate to a farmer in Malawi because they don't personally know one. Given the connections between the Mormon videos and my own work, here are some insights I've taken from this video series. 1. Find people/characters who break stereotypes. If you're not familiar with the Church of Latter-Day Saints, there's a stereotype -- at least in the United States, where the church started -- that Mormons are bland conformists who reject all fun. It's clear the producers of this video series sought to film people who break this stereotype. 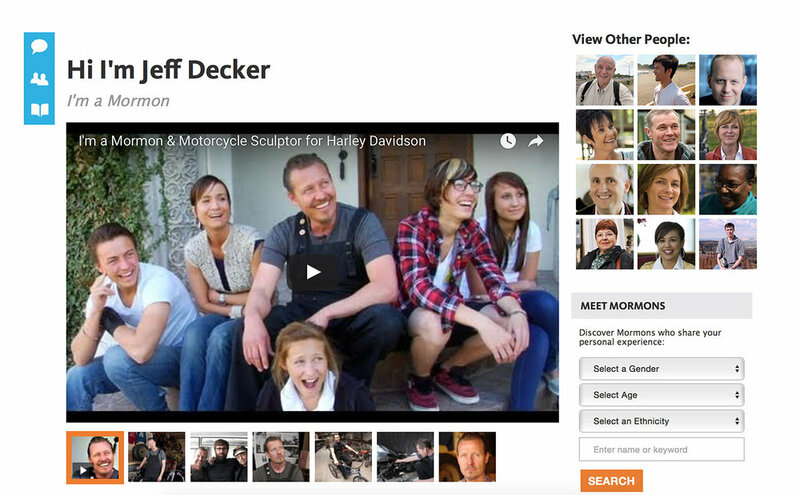 The first "I'm a Mormon" video I watched (and still my favorite) was about Jeff, a motorcycle sculptor and father of four who turned his artistic hobby into a job. At one time he was even the official sculptor for Harley-Davidson. Perfect stereotype smasher. In the video, Jeff even says, "The vast majority of the people that I associate with aren't members of the church. But they all tend to go away, after I get to know them, and all the stereotypes that they think of Mormons, I help break down for them." 2. Be on the lookout for surprises. Many of the "I'm a Mormon videos" contain surprises in what people say or do. This video about Lisa, a high school student, has several surprises: flour blowing up from a KitchenAid she's using with a niece, a timer going off at an inopportune moment, a recounting of one of the most formative experiences in her life -- and it's not about being Mormon, which I thought it would be. 3. Focus on story above all else. In most of the "I'm a Mormon" videos I've watched, you rarely hear about how the church has influenced a person's life. For the most part, you hear about the church only at the very end, when the person being profiled says, "I'm a Mormon," like in this fun story about Amos, one of the actors on Yo Gabba Gabba. This is obviously a conscious decision to get the viewer interested in the person, and from there get the viewer interested in the church. Other things I love about this series: – Many videos start with a mini-story where the subject's personality shines through. Oftentimes the little story isn't related to the bigger picture, but hooks the viewer. – The music perfectly fits each person. – Many non-English stories are not subtitled in English. To me, this lack of subtitles says, "We made this specifically with you in mind, Spanish-speaker/Japanese-speaker/etc." Now that you've watched a couple of the videos, don't you want to watch them all? Photo caption: Screenshot of the "I'm a Mormon" video page.